Star pictures by Dave Thompson, amateur astronomer from Medomsley, County Durham, taken at the Kielder Forest Star Camp.Stargazers capture stunning views of Northumbrian skies. An audit of external lighting is underway in Kielder Water & Forest Park and parts of Northumberland National Park and residents in selected areas have been sent letters to explain the process and ask for their co-operation. The exercise is a key step in an application process which will eventually be adjudicated by the Tucson-based International Dark Skies Association. The aim is to demonstrate a commitment to tackling wasteful light pollution and helping us maintain the rural character of the area. If successful, Kielder Water & Forest Park would become England's only Dark Sky Park and the National Park would assume the mantle of Europe's biggest Dark Sky Reserve. The ambitious project is a joint bid by the Kielder Water & Forest Park Development Trust, Northumberland National Park and Kielder Observatory Astronomical Society. 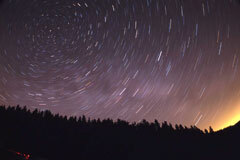 And with visitors still flocking to the acclaimed Kielder Observatory, amateur stargazers attending the Kielder Forest Star Camp have captured staggering images of celestial objects above the 155,000 acre wilderness. Nearly 150 people from across the UK camped out for up to five days drawn by some of England's darkest skies, where light pollution doesn't snub out the beauty of the stars. The Chair of Forestry Commission, Pam Warhurst, has praised Kielder's soaring ambitions after visiting Kielder Observatory to support a bid to create Europe's largest area of protected night sky in Northumberland. If successful Kielder Water & Forest Park would become England's first Dark Sky Park and Northumberland National Park would be Europe's most extensive Dark Sky Reserve. Reaction has been very positive, but consultations continue to refine the plans and boundaries. "It was a thrill to have Pam Warhurst at the observatory and she was impressed by what's been achieved in this fabulous corner of England. The facility - underpinned by the hard work of KOAS volunteers - has been the catalyst for much that has happened in terms of the dark sky bid. If we are successful in gaining added protection for the area it will create a long-lasting legacy enabling future generations to enjoy the wonderful starry sky that inspired me and my fellow stargazers." Exciting moves have been revealed to create what would be the third largest area of protected starry dark sky in the world in deepest Northumberland. Kielder Water & Forest Park Development Trust and Northumberland National Park Authority are consulting on securing dark sky status for nearly 400 square miles of spectacular countryside in England's wildest county. The prestigious designation is awarded by the International Dark Skies Association (IDA), based in Tucson, USA. Worldwide there are just 12 such preserves, including the two largest in Big Bend National Park, Texas, and Mount Megantic in Quebec, Canada. Northumberland has more dark skies than anywhere else in England, according to the Campaign to Protect Rural England (CPRE). ** The Milky Way stretches from horizon-to-horizon, while galaxies millions of light years away are naked eye objects. But such breath-taking views are becoming a rarity. Light pollution means that over 85% of the UK’s population has never seen a truly dark sky. Even Northumberland is not immune. Between 1993 and 2000 the North East's area of dark skies shrank by nearly 30%. Since then the spread of light pollution has continued. But it is not too late. Duncan Wise, who is leading the Dark Sky Reserve Project for the Northumberland National Park Authority, said: “Dark Sky status will help us protect the quality of the night sky. With public support we believe we can make this happen. It will be a spur to sustainable tourism, help cut energy costs and benefit nocturnal wildlife.” Since the start of the year Forestry Commission wildlife rangers, stargazers from Kielder Observatory and Newcastle astronomical societies, National Park Rangers and volunteers have taken hundreds of light meter readings across the proposed dark sky area on clear moonless nights. Readings confirm that the North East retains some of England’s darkest skies. The National Park Authority has written to all National Park residents explaining the process and inviting comments on a proposed core zone to be protected from light pollution in the darkest part of the park. Meetings with parish councils are also being held. Kielder Water & Forest Park Development Trust will also write to Kielder residents seeking their views on the plans, following discussions with Kielder Parish Council. Byrness and Rochester and Stonehaugh Parish Councils are supporting the plans, as are many local businesses. Open Nights for local people have also been staged by Kielder Observatory to express its keen commitment for the move. Duncan Wise added: “We want to build a consensus and shape our plans with the public. But what a fantastic opportunity we have to protect our cherished skies. No one benefits from poor lighting. It takes away the beauty of the night sky, often disturbs sleep patterns and can have a negative impact on our wildlife. By acting now we can protect the special quality of the National Park that is valued by residents and visitors alike for future generations to enjoy.” Tell us what you think. John Wilson, who owns Whitelee Farm, near Carter Bar in the Northumberland National Park, said: “We’ve got three holiday cottages and such has been the growth in interest in stargazing that we now put binoculars and star charts in the rooms for guests. The National Park has taken light metre readings on the farm which confirms what we can see with our naked eye - that we have glorious dark skies which are a major draw to visitors. Getting dark sky status would be a great way of promoting tourism, as well as preserving something very special about our landscape." 2. What are designated dark sky areas?Dark Sky areas are parks or other public land with exceptional starry skies and natural nocturnal habitats where light pollution is mitigated and natural darkness is valuable as an important educational, cultural, scenic, and natural resource. Dark Sky Parks usually have one or a small number of land owners with lighting control over the area. Dark Sky Reserves have a large number of owners and have a dark core surrounded by buffer areas where partners are keen to engage with the dark skies promotion. What do we need to do?To attain Dark Sky Park and Dark Sky Reserve status it is necessary to demonstrate a commitment to minimising light pollution. The application process requires an audit to be carried out of all outside lights in Kielder Water & Forest Park and the proposed darkest core zone of the Northumberland National Park Dark Sky Reserve over the next few months. This is to provide evidence to the IDA of the percentage of external light units that are already compliant, ie that are low wattage, or are installed correctly with no wasted light being emitted upwards into the night sky. We may already be dark sky friendly, but we won’t know until we have completed the audit. 3. International Dark Sky AssociationThe IDA is the leading organisation combating light pollution worldwide. The IDA awards the designations of ‘Dark Sky Reserve’ or Dark Sky Park’ to those wilder places that demonstrate an ability to conserve the dark skies above them and are committed to providing opportunities for the public to enjoy them.